Outdoor patios are a great place to sit back and enjoy a beautiful day. They're the epicenter of back yard barbecues. And brick is one of the most popular choices for outdoor patios and walkways because of its rich and classic look. However, over time; dirt, grime and even moss can cause nasty discoloration, leaving your patio looking dull and unwelcoming. Luckily, pressure washing can restore brick to its former glory. It's important to thoroughly soak the surface of your patio/walkway with regular water, using a low pressure spray pattern. Rinsing the surface before washing will create a protective barrier between the brick and detergent. This is important because you don't want detergent soaking into the porous brick. After the surface is nice and wet, you're ready to start. To achieve the best results, use a low pressure stream and lots of detergent. A high pressure spray pattern can force detergent to be absorbed into the brick, which can leave ugly stains. It's also helpful to divide your project up, and work in sections. Apply the detergent to your work area and allow it to settle on the surface for 5 to 10 minutes. If you notice any places starting to dry, apply more detergent water as needed. It is very important to allow the detergent to soak in a little bit and work its magic. 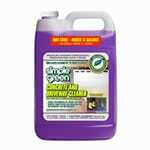 Once the detergent has had a few minutes to loosen stains and lift dirt from the surface, the pressure washer will more effectively spray the surface clean. Now it's time to flush the detergent from the area with a basic rinse. Turn your detergent tank to "Off," and squeeze the trigger to flush the detergent from the gun and hose. Stand back and begin rinsing from the same section you began applying detergent. Use a high pressure spray pattern and spray from one end to the other. Cover 2-3 rows of brick at a time, moving slowly to ensure all the detergent and residue is washed away. You may have to repeat this process multiple times or move the spray gun slightly closer for deeply stained areas. If you find any white powdery residue, otherwise known as efflorescence, when the brick dries, don't worry. This can be easily taken care of with an efflorescence remover. Unfortunately, this needs to be done by hand, using a brush. Make sure to follow the manufacturer's directions and do NOT use your pressure washer. Pressure Washing Brick Patios and Walkways.. Our Power Equipment Direct how-to library can help you learn about Proposition 65 Product Labeling, Sales Tax Information and Product Recalls for Pressure Washer Equipment.